While these days many corporate sponsors are running away from anything with even the slightest whiff of celebratory excess, there's one company that has embraced it, in good times and bad, for over 85 years. Why is this? Because Macy's, in part, has made its name with events like New York City's 4th of July Fireworks Spectacular (first sponsored in 1976) and Macy's Thanksgiving Day Parade (first sponsored in 1924), which have been core staples of the venerable department store's marketing strategy -- not only in New York, but through media across the world. By many accounts this is the 15th recession since that first Thanksgiving Day parade, which Macy's helped found in 1924. So why, when so many other companies are cutting back, does Macy's stick by celebration sponsorship, even in times of severe economic distress? Well, in part because Macy's takes ownership of these events - going so far as to sell the sponsorships themselves. Macy's has become a fabric of the event, rather than simply using events as one vehicle of many to convey the brand message - Macy's historic brand story and their "owned events" are intertwined. While this may make these programs difficult to unwind, perhaps there is a good lesson here for partnership marketers. In the 1920s many of Macy's department store employees were first-generation immigrants. Proud of their new American heritage, they wanted to celebrate the United States holiday of Thanksgiving with the type of festival their parents had loved in Europe. The only stoppage in the parade's history came between 1940-44 as a result of the need for rubber and helium in World War II. Today, the parade reaches 44 million viewers worldwide with the flagship store as its backdrop. While the Fourth of July Fireworks Spectacular doesn't have nearly the history (or not coincidentally the brand impact) that the parade has, Macy's has been part of the nation's biggest fireworks display since it was first televised nationwide on NBC in 1976. Other partners for this year's show include Energizer, Levi's and Planters. "I want people to know that everybody is going to be fine, and that we're optimistic about the future," says Robin Hall, executive producer of the 2009 Macy's Fireworks Spectacular. Some similar assurance perhaps could be used to cheer up Macy's investors who have seen profits slip in the midst of the recession. 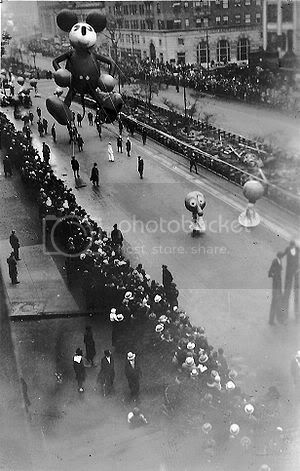 Can you imagine a Thanksgiving Day without what many now simply refer to as the Macy's Day Parade? In a day and age where the name of a baseball park can change three times in five years (AT&T Park), consumers reward commitment and consistency. The continuation of a long term commitment may make for short term stress, but to risk the brand's greatest asset, it's core brand message, would perhaps be the most dangerous strategy of all.